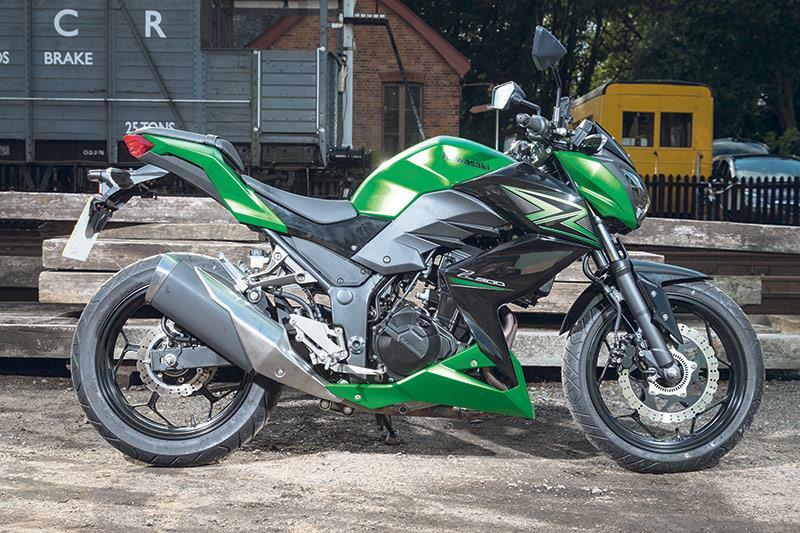 There’s more to learner bikes than you might think and riders with A2 licences now have their pick of some amazing bikes. But when it comes to making the investment, which one will turn two years of power parole into pure pleasure, and continue to excite well into the future? We’ve ridden three of the best 1400 miles in a week to find out. ands up if you fully understand the current motorcycle licensing laws… no, me neither. Essentially the A2 licence is for riders aged 19 to 23 between their CBTs and their full licences, while the A2 bike category limits machines to 47bhp and a power-to-weight ratio of 0.26bhp per kilo. What this means in reality is that between 125cc learners and limitless leviathans lurks a growing class of exciting A2 machines. They’re handsome, practical and powerful enough to entertain more than just impatient youngsters waiting for their full licence. Choosing a motorbike is always difficult, but especially so if you’re simultaneously having to spend on training, tests and kit as well. It’s a big investment, and one that you can’t make on the basis of a quick test ride. That’s why I’m taking three of the top competitors in the class and putting them through the gauntlet of real life. I’ll be dragging these compact characters over 400 real-world miles each during the course of a week, doing motorway miles and carving through countryside, riding day and night in hail and gale from city to shore - exactly the kind of riding that will highlight which is the top pick. Yamaha were a late entry to the A2-licence party, but stylishly so. The 321cc, 41.4bhp R3 was always going to be a major class contender. I’m sorry, R3. Your stunning sportsbike looks, nimble chassis and eager throttle response begged for country corners. But here we are stewing on a traffic-laden dual carriageway, and the A1 North is kicking your A2 arse. It started so promisingly, the 41.4bhp motor racing through the revs to sit happily in top gear at cruising speed, with plenty more left at the wrist for swift overtakes. The tall tank creates the sporty impression I’m sitting in rather than on it, while high-mounted clip-on bars make for a fairly upright, comfortable riding position. But beyond an hour I’m shifting uncomfortably. The vibrations aren’t massively annoying yet I’m feeling their effect through hands and feet, while wherever I put my aching knees there seems to be a fold of fairing in the way. The traffic snarls tighter, the R3 snarls in frustration, but at least I can appreciate the well-designed clocks, speed instantly noticeable beside the fuel gauge and useful gear indicator. By the time I double back, night has fallen and so has the sky. I dislike riding in the dark or wet so it says a lot that I can push the R3 even in hail, trusting in the strong headlights and standard Michelin Pilot Street tyres to do over 80mph. Battling wraiths of spray we fight our way home, and by the time I squelch into the garage I’ve forgotten it’s only 321cc. Whether it’s Leicestershire’s curvaceous corners or the single sunbeam gilding my gloves, I’m falling for the R3 today. 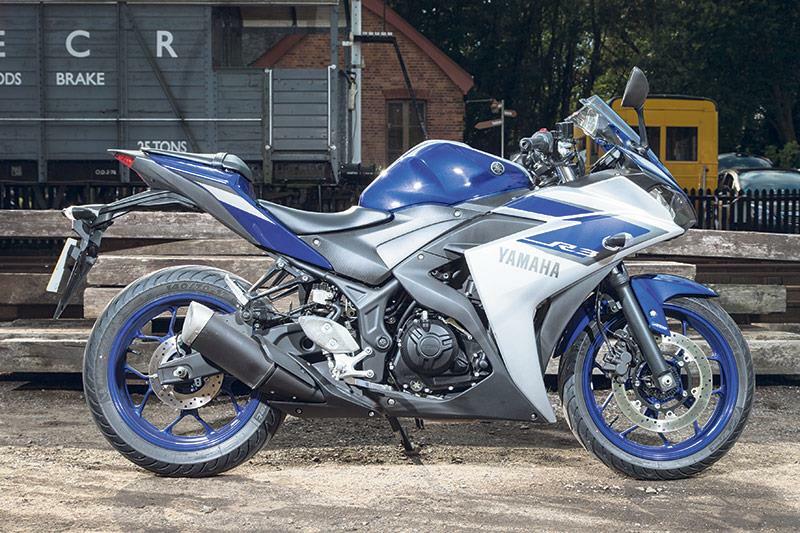 Insanely agile with precise, stable handling, the Yamaha is in its element now. It tips in like a dream and slips effortlessly through the gears. The engine excites, able to overtake easily in fifth while joyful playing further down the gearbox sometimes triggers the shift light on the dash. Brakes lack a little bite, taking a heavier, longer lever pressure than I’d expect from a light sporty bike, but the ABS as standard is reassuring and only once flutters in on the back brake. In Leicester’s busy streets the low, narrow seat provides flat-footed stability at a standstill while a beautifully light clutch lever and short first gear make for easy low-speed manoeuvres and quick getaways. The R3’s slender chassis also encourages swift filtering and we make great progress through town, but this unfortunately highlights how useless the mirrors are. Showing only elbows, I’m forced into a head-bobbing, arm-flapping chicken impression to keep an eye on Leicester’s dangerous drivers. But all is forgiven on the final, grin-inducing blast back. I never feel that I’m demanding anything the R3 can’t supply; it’s got the performance to delight veterans and allow novices to grow their skills. And to top it off, it’s made an average 70.26mpg without trying. The Ninja 300 engine in a new streetfighter chassis. At 296cc it’s the least powerful, but still has some impressive features. It’s not really fair on the Kawasaki to follow the Yamaha. From its characterful styling to technicolour clocks the Z300 seems more toon than tool, and at first I can’t stop comparing the two. The Zed’s 296cc engine performs admirably at high revs but I can hear it trying harder than the R3. It doesn’t pull as well at low rpm, and my wrist works hard out of roundabouts to get away from traffic. The riding position is strikingly upright but, thanks to the muscular chassis, windblast isn’t as bothersome as the increasingly uncomfortable high revs, 80mph demanding 9000rpm. Yet hours later I’m smiling more, not less. Once I accept the bike’s limitations I can play with its revvy character and poised handling, pushing harder and faster to explore our limits under the setting sun. The brakes have great power and feel, which couple with effective headlights to turn diving into unknown corners in the dark from grimace to grin. I never feel the ABS kick in, but much like the slipper clutch that comes as standard, its presence reassures. The 65.32mpg average is still great, especially with a 17-litre tank, and I’m surprisingly free of aches after seven hours riding. When Shelley wrote ‘Hell is a city much like London’, he was being unkind – to Hell. But the nerve-jangling, bicycle-swerving, camera-infested chaos is the Kawasaki’s hunting ground. We make great progress through terrifying rush-hour traffic, the narrow chassis and flickable steering making filtering a breeze while second gear is broad enough to provide responsive control and an engine note that warns others of our presence. Excellent mirrors are a definite win over the Yamaha, too. The rest of my journey is a little muted, like my overall impression of the Z300. There’s loads to like and it will make owners happy, but it’s outdone by its excellent competition both in performance and practicality. Launched in 2013, the 471cc engine makes 46.9bhp and is right at the top edge of the A2 power limit. Honda, it’s 2015. All A2 bikes should have gear position indicators. Obviously I can cope without, but wouldn’t the concentration wasted tapping through gears to check be better spent focusing on the rain-soaked motorway? The R3 has one and it’s £700 cheaper. I indulge in my visor-steaming rant, partly because the Honda is so well-rounded it’s hard to find anything else to complain about. The 471cc, 46.9bhp engine is on the edge of the A2 power limit and is eager to push on over big miles. The brakes require a firm pull to engage, effective but not so sharp you’re afraid to grab them. The ABS never intrudes, even when braking heavily through lurching traffic at sodden Stonehenge. Weaving through captivating countryside and seafront streets showcases the Honda’s versatility. Smooth and strong power delivery has enough torque for stress-free manoeuvring around town, but pushed hard it delivers a dynamic, flowing ride that people beyond the A2 licence will dig. This particular bike has the Akrapovic slip-on exhaust, a £495 official accessory that adds less than 1bhp, but still meets A2 constraints. 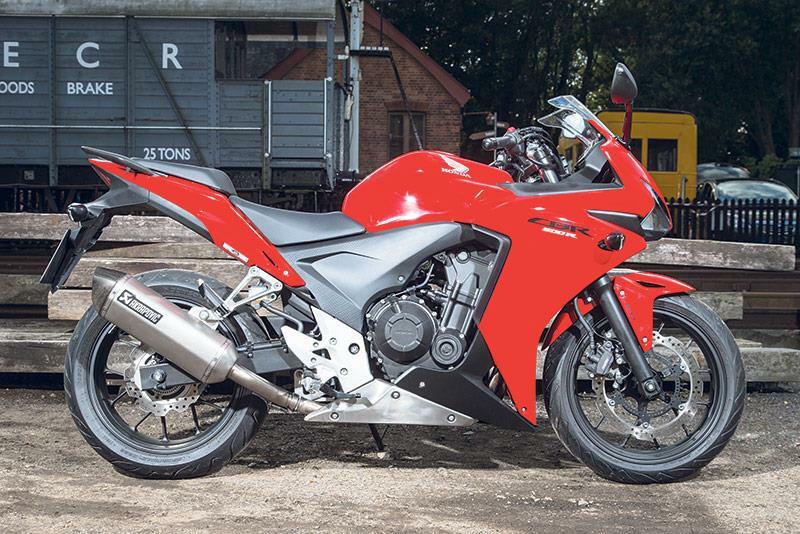 The CBR500R is the heaviest, tallest and most powerful of the three bikes and feels it, remaining solid and comfortable for hours. As we arc over a hill, the world suddenly seems strange and sideways. I barely recall the weather warnings before the gale-force wind slams us aside, but the Honda doesn’t stumble and we push on to the coast. Torrential rain hammers and blinds me. Lorries veer between lanes. The M3 is a fast-flowing river over an inch deep. It’s the worst ride I’ve ever experienced but I’m glad it’s on this - the stability, even power delivery and riding comfort mean I can concentrate solely on surviving, knowing I can rely on the machine below me. As the sun finally breaks through we charge the final hundred miles home, knowing for certain that this brilliant bike can go the distance. All three are impressive motorbikes, not just gap-stoppers. They’re cheap to buy and run yet finished to a high quality, robust in stature and power while the inclusion of previously pricey additions such as ABS and fuel gauges as standard shows that the manufacturers take them seriously. We should too. With such distinctive characters and so much to like, different riders with different journeys will be attracted to each one, but for the best all-rounder any half-sensible person would crown the Honda. It performs brilliantly in every environment and weather, with the power and handling to entertain newbies and experienced riders alike. But sensible doesn’t stir the soul, and when they’re all lined up before me it’s the R3 I want to leap back on. It’s not the cheapest or most economical, the most comfortable on motorways or the safest in town, but it’s a wild little thing that makes my heart sing. The CBR500R is the agreeable kind that I’d take home to show my folks, but the R3 would always be the one that got away. Restricted KTM 390 Duke for A2 licence holders?